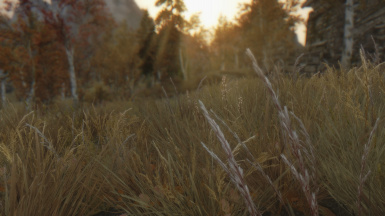 A personal take on skyrims grasses--inspired and built upon Tamu75s Unique Grasses plugin. Spruced up several areas, like falkreath stormcloak camp/orphan rock. Isolated thick cattail plants to lake ilinalta area, the rest of the riverbed grass is sparse. Added in a couple meshes I forgot to put in the update. Completely overhauled the mod, with lots of new grasses, more "mowed" areas and new wildflowers and rive plants. Check the posts section for details. 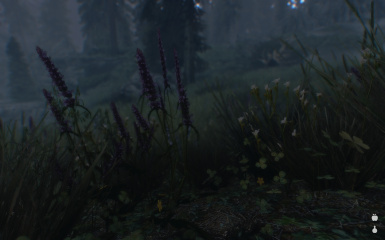 Slightly denser forest grass--more areas clipped thanks to mindw0rk2 and Rusey's reports. 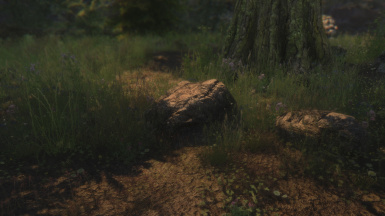 -Added a rockgrass01 mesh in the optional section for users who suffered from strange flat rock textures everywhere. Seaweed now fully underwater/denser forest grass/tweaked marsh grass -- Shorter grass version added. 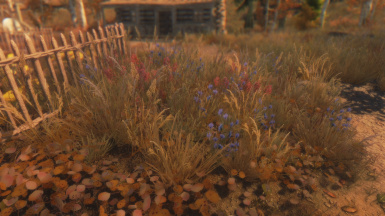 Small edits to fallgrassdirt (removed the ridiculous amount of leaves to look more trod on) and lessened snow grass because there shouldn't be a ton of grass in snowy areas (at least not as much as there was). Clipping Fixer Addon is greatly improved. Clipping fixer refined. 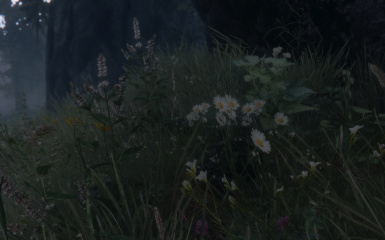 Fixed ivarstead/grass in stables and dark texture bug in falkreath and other places. More clipping edits to come. 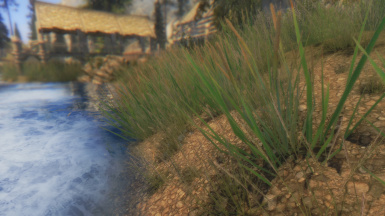 Tiny grass edit as well as a clipping fixer for those drowning in falkreath. Available in one .esp or seperate .esps so you can put the clipping fixer at the bottom of your load order for maximum compatibility. ESPS also available separately for updates or 1k/512 users. Added in all necessary mipmaps--1k already had all it's mipmaps luckily. A 512 version has been added. Verdant has reached 2.0! Please check the Posts section for a list of all the changes. You could install manually, but it's a lot of textures/meshes to delete, so I would recommend using a mod manager. 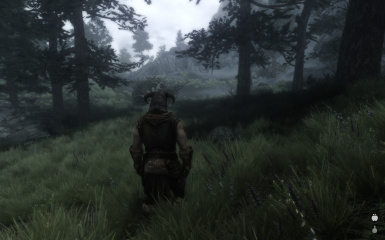 Load and install this AFTER SFO and any other mods that alter the landscape, specifically mods that add grasses to the game. 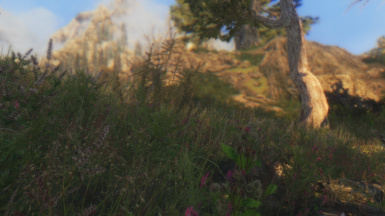 IF YOU USE THE FULL VERSION/ROCK GRASS VERSION OF THIS MOD, ALWAYS PUT IT AT THE BOTTOM OF YOUR LOAD ORDER FOR BEST LOOK. 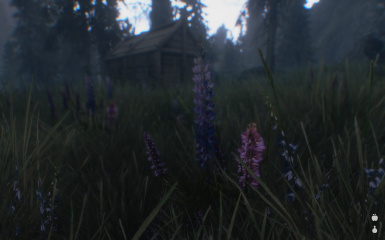 -Skyrim Flora Overhaul - This only affects grass, so there will be no problems with the awesome trees that Vurt delivers, but be sure to load this AFTER SFO and INSTALL AFTER SFO, otherwise the grasses will look strange. 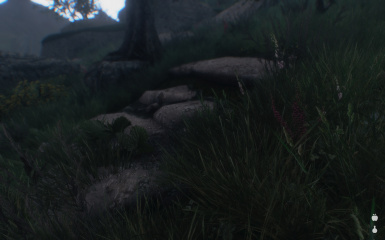 -Dark Fantasy Overhaul - This is compatible; just install Verdant after. 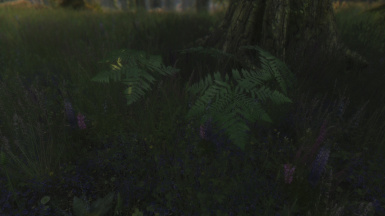 -Unique Flowers and Plants - This is also compatible, but be sure to put Verdant after. 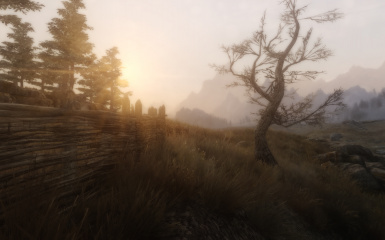 -Tamriel Reloaded Grasses - This grass mod is awesome, but is no longer compatible with verdant 2.0. -Decrease That Grass - This is not compatible with verdant, which is why I've made a rockgrass/waterplant free version to increase performance. -Lush Trees and Grass - This is actually NOT compatible, as you may see in Supertin's video. 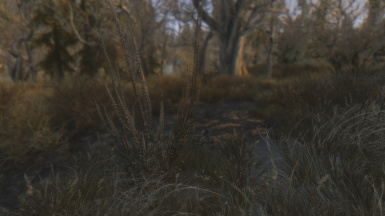 When you install this mod it's reverting many grasses back to their vanilla textures. This is still compatible with Lush Trees as it has nothing to do with grass. THIS MEANS THAT GENERALLY ALL GRASS MODS ARE INCOMPATIBLE ... if you're unsure, just don't do it. 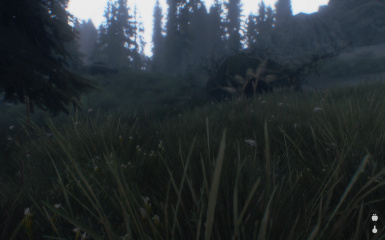 This mod takes care of practically everything, including the GoS tweak, dense grass, and many sizes in textures for better performance. 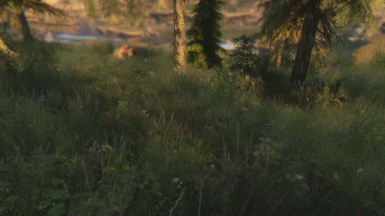 For grasses it's better to just say NO to compatibility, and if you do use grass mods, load this AFTER these mods and allow it to overwrite ALL files. 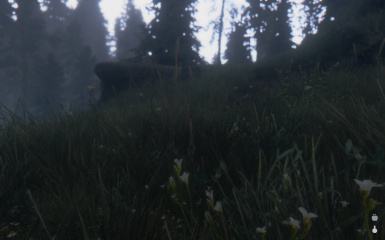 -Grass on Steroids - Obviously not because I already use this tweak - GoS will not work with this mod at all. I USE SFO -- HOW DO I MAKE IT COMPATIBLE WITH VERDANT? 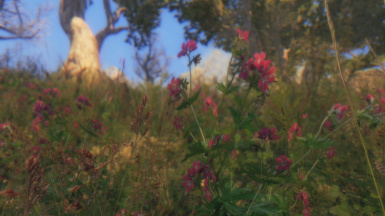 Install this AFTER Skyrim Flora Overhaul and let it OVERWRITE ALL. Then load Verdant AFTER SFO and it should run fine. 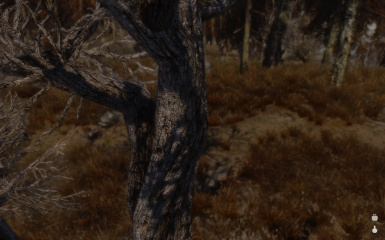 Or uncheck SFO's esp and then you can just use the trees of Vurt's mod. I'M GETTING A HUGE FPS DROP WHAT CAN I DO? 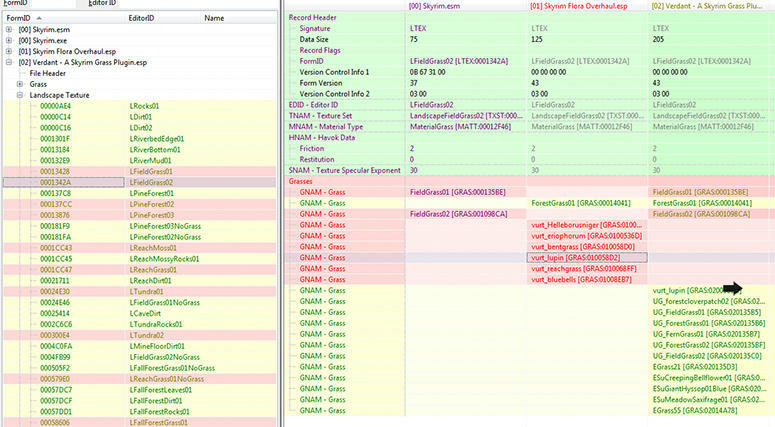 Here's what's in my skyrim and skyrimprefs ini files. 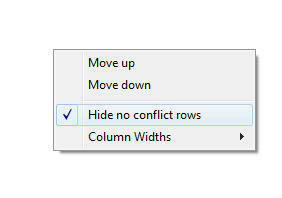 Place these values into the right categories and set your files to 'read only'. If you use 4k-8k textures in various areas you could definitely slow down your computer. There is a slight fps drop with this mod, but the damage is fairly negligable ... 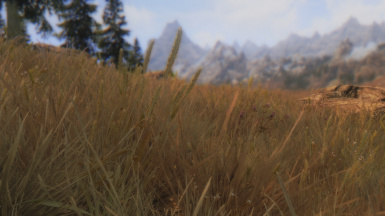 There are people with potatoes who can run this grass mod with the right settings. 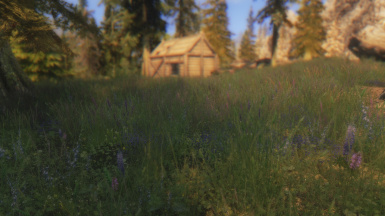 I run this mod with a GTX 760 4GB with imingrasssize=70, so this mod should be fine for most mid-to-low range computers, even with some of the grasses at 2k resolution. 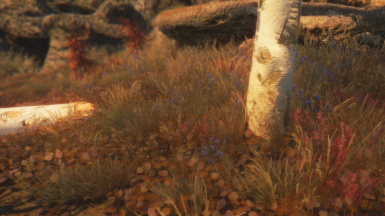 There could also be an issue due to a combination of heavy mods like Skyrim Bigger Trees and SMIM, as well as heavy scripting mods. If you still suffer an FPS hit with iMinGrassSize=70, raise this setting to 80 or 90, or even 100 and higher to see if it helps. 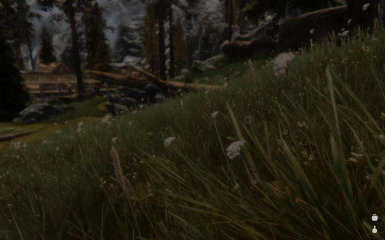 If you're using enb, make sure to OPTIMIZE YOUR ENBLOCAL FILE (look at this site for more in-depth ways to help with FPS http://www.nexusmods.com/skyrim/mods/50214/? DOES THIS REPLACE GRASS ON STEROIDS? 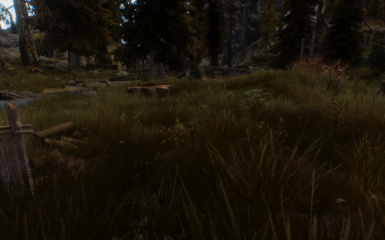 No, this is just a standalone grass mod that uses the GoS tweak for dense grass with less of a performance hit. 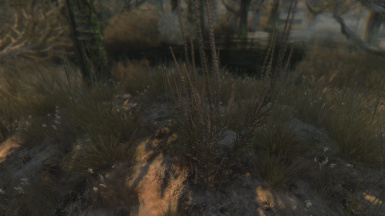 Grass on steroids uses vanilla grasses and meshes. 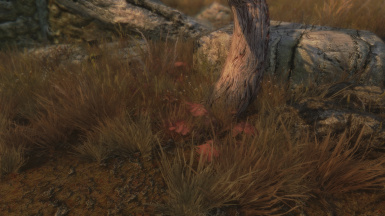 It's a simple tweak in tes5edit where you find a grass, ANY grass, and change the density to 255. It's THAT SIMPLE. 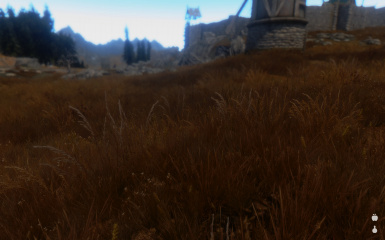 YOU COULD DO THIS TO ANY MOD AND MAKE YOUR OWN GRASS ON STEROIDS TWEAKS TO ANY GRASS YOU WISH. 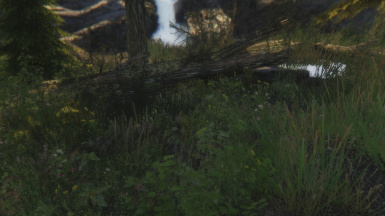 So just like with Grass on Steroids, you will get a slight FPS hit at lower settings (like iMinGrassSize=50 to 70) but you will apparently GAIN FPS at higher settings like 125 ... although the grass will be less dense. CAN I GET REALLY DENSE GRASS BY USING GRASS ON STEROIDS, LUSH GRASS, ETC?? NO--they are not compatible. 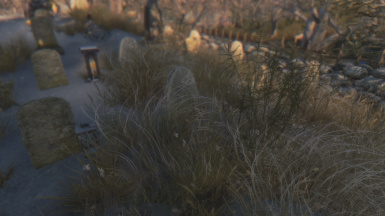 These enhancement grasses won't even help with density seeing as these grasses are totally different meshes/grasses than vanilla, so instead of this mod you'd have some ugly-looking grass, if you had any grass at all -- so just DON'T DO IT. 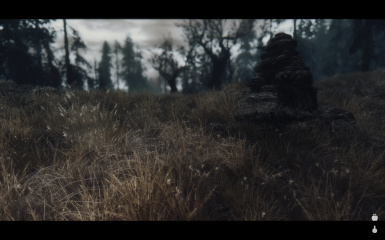 CAN I USE THIS WITH OTHER GRASS MODS? 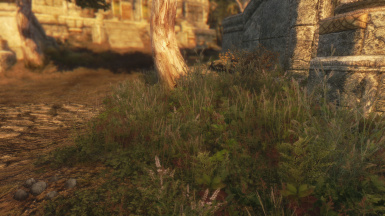 No, this mod is standalone and downloading other mods like Unique Grasses and Groundcovers is just going to overwrite Verdant's grass textures ... but you can make your own tweaked esp file using tes5edit. Details are below. 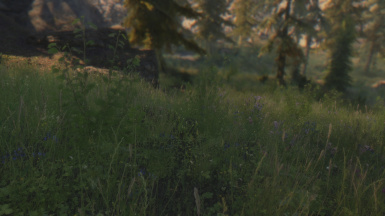 MY GAME IS CRASHING WHEN I LOAD GRASS!! WHAT GIVES!?! 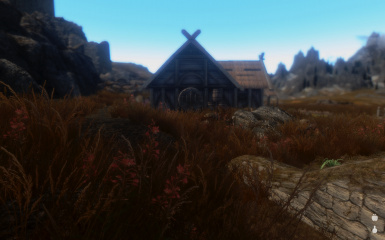 WARNING: This mod in it's latest stage does now in fact have landscape texture worldspace edits in it's .esp, which is essentially harmless in itself, but if you have many, MANY mods that alter your skyrim worldspace (house mods, village mods, landscape overhauls), your game can lose stability from this, and even crash. Always be aware of the mods you are installing, and make sure you read all the instructions and suggestions for best compatibility. 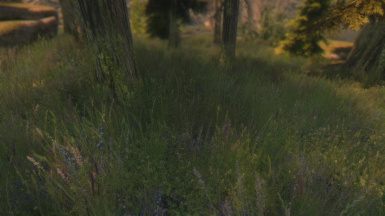 I have lowered the boundaries on many of the grasses in this mod, or eliminated them completely to add density at higher iMinGrassSize -- which means that at a lower number you're actually having MULTIPLE GRASSES SITTING ON TOP OF EACH OTHER, and at 10 this is probably many times over, so please stop perpetuating the myth that a low iMinGrassSize is 'high quality' for this mod. It is honestly just an easy way to melt your video card. The whole point of adding the Grass on Steroids tweak was so people could have their cake and eat it too; nice looking grass with decent FPS. The 'high quality' version should never have to be higher than 50 for dense, lush grass. 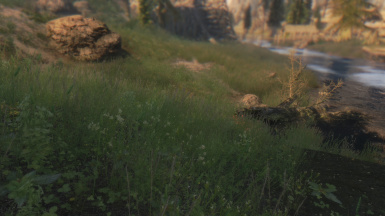 GRASS IS CLIPPING THRIUGH STUFF LIKE ROCKS! Thems the breaks unfortunately when you download dense grass. There is nothing I can do about this issue. 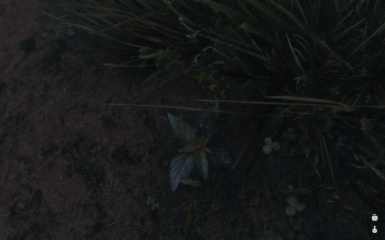 I am currently trying to spruce up various areas in the game, but it's not possible to remove every blade of grass from every rock. 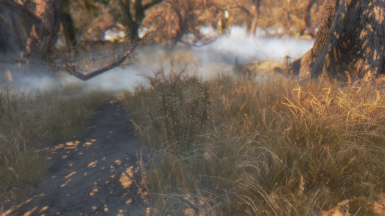 Every dense grass mod you download will do this. No I will not be making any compatibility patches most likely, simply because I don't generally use any of these mods. 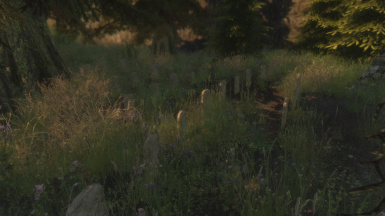 The only landscape edit mods I use currently are Skyrim Graveyards and Immersive Environments Project - The Marshlands which both work well with this mod. I know they're probably popular and everyone on the nexus uses them, but it doesn't matter to me because I don't. You're more than welcome to make your own compatibility patches however, and watching this video will teach you all you need to do in order to achieve this. Just load up whichever mod you like and Verdant in the Creation kit, and find all the towns/houses in the object window, which will load up in the render window. Turn on landscape editing and start painting out the areas you don't want to have grass (use simple ground textures like LAND_DEFAULT, dirt01, dirt02 and dirtpath etc since these have no grasses tied to them ... also rock textures should be fine (you can sample an area by putting your brush cursor over it and pressing "i" if you'd like to make sure you pick the right textures). STILL CONFUSED? 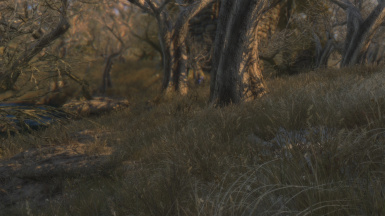 CHECK VURTS GREAT FAQ ON GRASS MODS FOR MORE TROUBLESHOOTING. 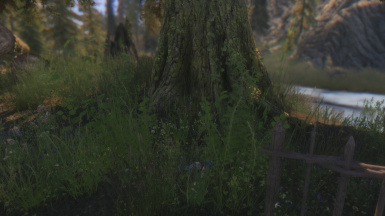 -Skyrim Flora Overhaul - I highly recommend SFO 2.0+, Bent Pines for SFO 2.0+ and Large Juniper Trees; install Verdant AFTER SFO. 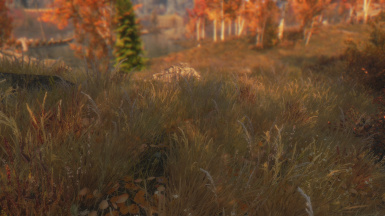 -Realistic Aspen Trees - It looks amazing with the fall forest grass; these textures were in my screenshots. 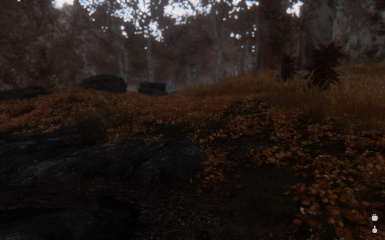 -Dark Fantasy Overhaul - A great landscape mod with a spooky vibe to it. 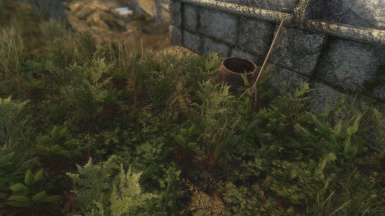 - Verdant for Bruma - DoctorShekel has made a verdant patch for Bruma! 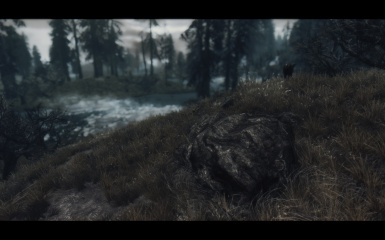 -Skyrim HD 2K and Skyrim HD - Terrain Parallax Tribute - My landscape textures of choice at the moment. 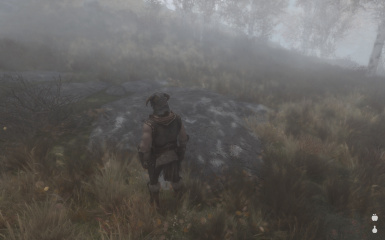 -Brigandage - Best bandit armor overhaul, and so many cool new armors! 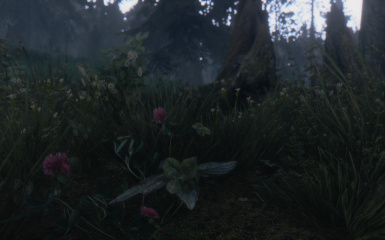 -True Vision ENB (Remastered Version) - My current ENB of choice. 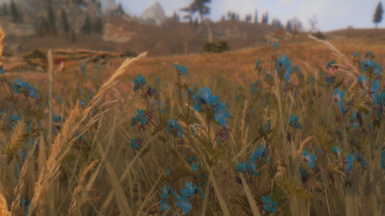 The latest screenshots are all taken with this ENB. 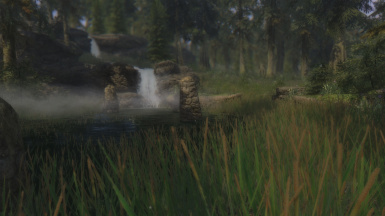 -NLA ENB - An excellent ENB/weather mod for a realistic look to your skyrim. 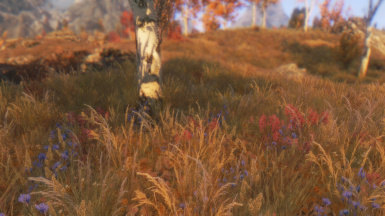 -Climates of Tamriel - I've been using this weather mod recently and I love it. Can't wait for the next release. 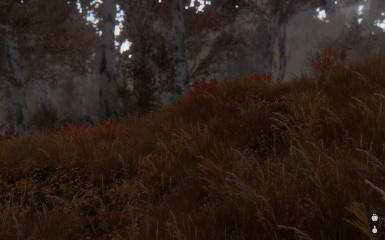 -Ruvaak Dahmaan ENB - A great cinematic ENB, perfect for those who like that movie look. 2.0 HUGE update. 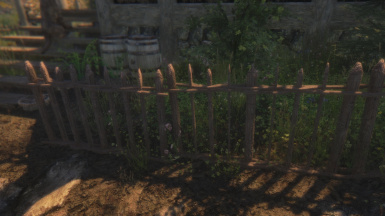 Details in the posts section. 1.6b update. 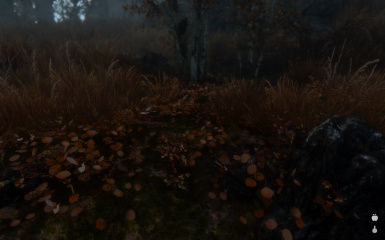 Slightly denser forest grass--more areas clipped thanks to mindw0rk2 and Rusey's reports. 1.6 update! Seaweed now fully underwater/denser forest grass/tweaked marsh grass -- Shorter grass version added. 1.4b update - clipping fixer refined. 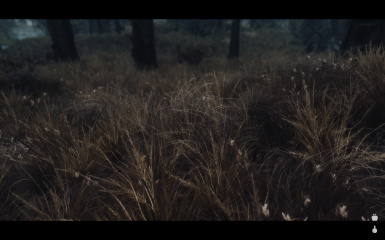 Fixed ivarstead/grass in stables and dark texture bug in falkreath and other places. More clipping edits to come. separately for updates or 1k/512 users. 1.2 is up! Added in all necessary mipmaps--1k already had all it's mipmaps luckily. A 512 version has been added! Yes you can, if you really want to that bad, but you gotta read this tutorial first (And have some basic knowledge of tes5edit, which you should glean from Gopher's videos that I added above). 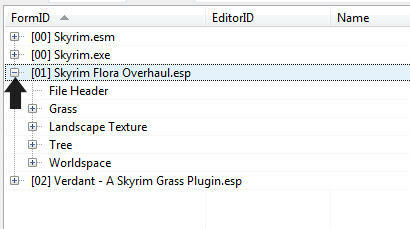 If you want that favourite grass of yours to show up in your verdant mod, simply load both Tamriel Reloaded Grasses (or whatever grass mod you want that flower from; for this tutorial I'll be loading Skyrim Flora Overhaul) and Verdant in tes5edit together (Tamriel Reloaded First; Verdant last). PRO TIP: Search for Verdant in the search box and select both mods. 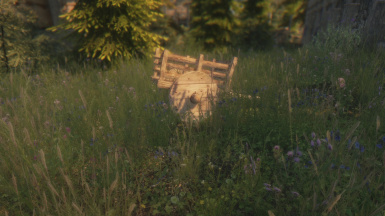 PRO TIP: Be sure to know the name of that flower so you can search for it inside Tamriel Reloaded's "Grass" section (learn what it is by looking through the .dds texture files; google .dds plugin for gimp or photoshop and you can take a look at the textures yourself). 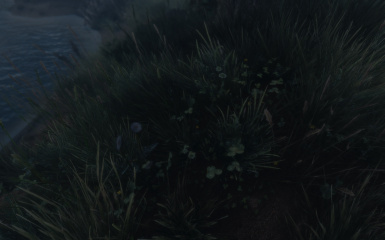 You can also add the mod author what the name is for the grass you like. Once you scroll through the list and find your grass name under the "Grass" tab, you can select it, right click and select 'copy as ovveride into ... "
You will suddenly be prompted with a warning. 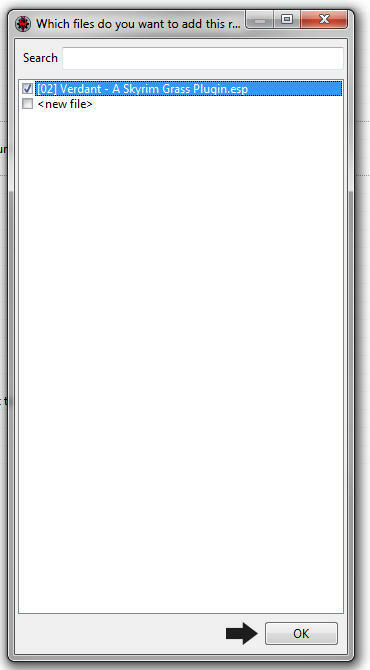 Say YES you want to continue, and a window will popup with Verdant and <New file> in the list. 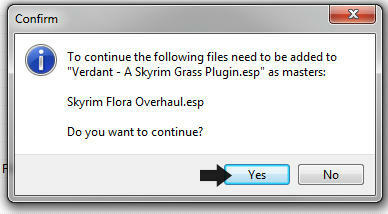 it will then ask you to confirm that Tamriel Reloaded Grasses.esp will now become a master file to Verdant. Click "Yes". 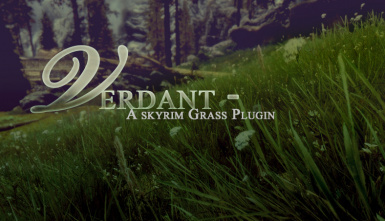 You now have the grass you were looking for inside of Verdant! Now select the grass in question. There should be details of the grass in the right-hand window. ... there will be a section called "Density." If you look at many of the other grasses in Verdant, they are set to 255. 255 is the highest setting possible, so if you put this number in (double click the number and type in 255) you will get MAXIMUM coverage of this flower and it will be absolutely everywhere. 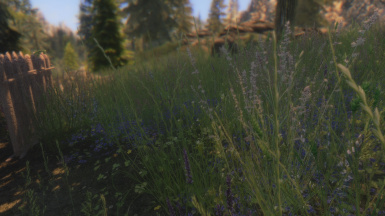 I have lots of flower mods already in verdant with some settings as low as 40, but the flowers are still abundant. You can change this number as often as you wish and tweak to what works best for you. More details on testing in-game later. 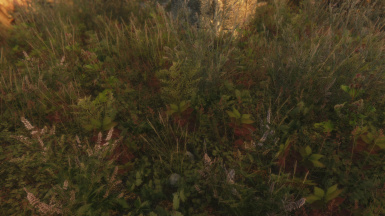 Now go into your "Landscape Textures" section of Verdant; you'll see a lot of different grass textures listed which are pretty self-explanatory. 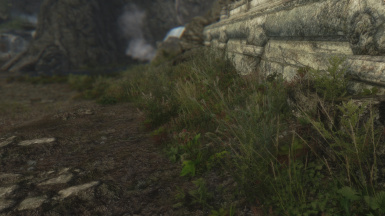 LRocks01 is a rock texture in skyrim, which once you click on it you'll see that in the Verdant row, only 2 varients of smallpebbles and a blueberrybush ( a twig-like grass) are the only grasses that appear on this landscape texture. 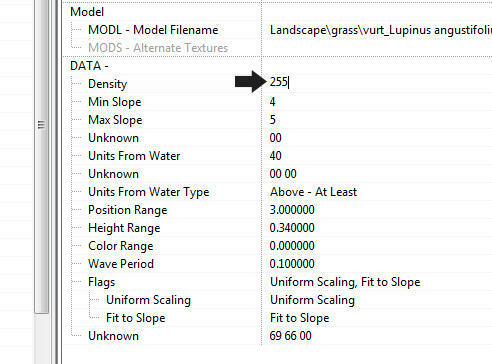 If you look at LFieldGrass02 you can see that many grasses are listed here, including sometimes 2 or more of the same grass for extra density, but there are a total of 15 grasses that are listed here to the LFieldGrass02 texture (which is exactly why verdant needs iMaxTypesPerTexure at 15 in order to work properly!). 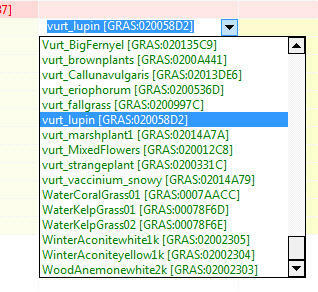 In order to add a new grass or flower to LField02, right click in the grass section under Verdant's file and select "Add"
A new line has been added to the list called "NULL-Null Reference". Double-clicking will display a dropdown where you can scroll and find the grass manually. 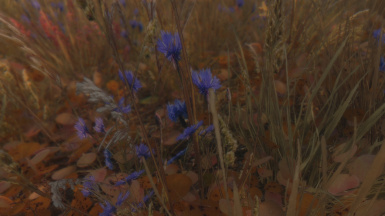 You can select the grass and you now have your edited flower added to the LField02 landscape texture. PRO TIP: If the grass you want is actually in the row before verdants, you can actually click and drag the grass into verdant's grass list! 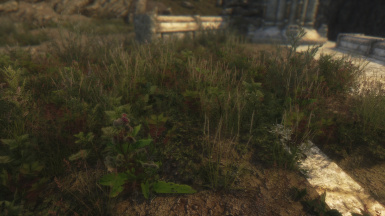 If you want to keep all the grasses in verdant's LField02 version as-is and add this flower, later you can change your skyrim.ini file to have iMaxGrassTypesPerTexure=16 instead of 15 to accomodate the new grass, but maybe you'd rather remove another grass to have your grass essentially replace it. You can right click on any grass you want to remove and select "Remove". That row will be gone and the grass removed from this landscape texture. 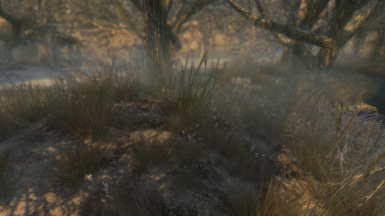 With these basics you can now modify any grass texture you want and create your own tweaked grass mod. Once you've made all the adjustments you want, simply close tes5edit. 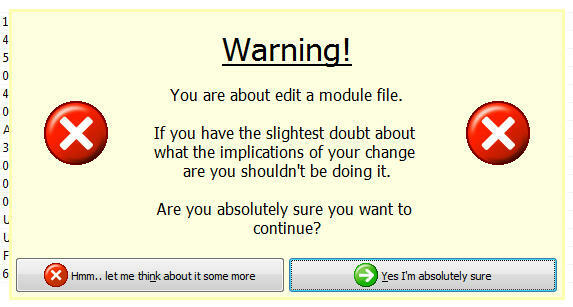 It will open a popup prompting you to save your changed esps. Verdant will be checked. 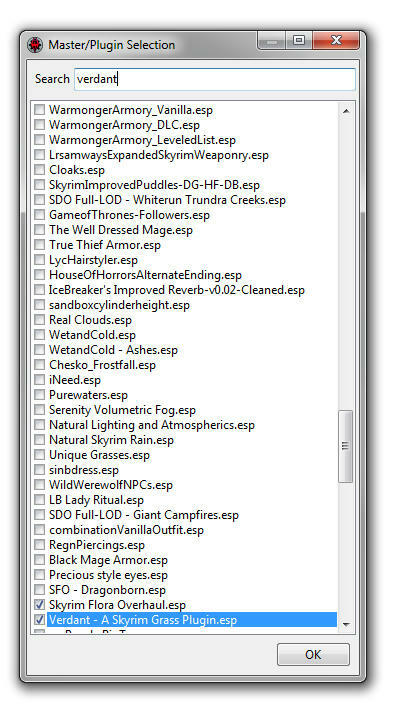 Press OK and Tes5edit will save your modified plugin, and if you have "Backup Plugins" selected on the bottom left, it will make a backup of your original verdant esp in a "Tes5edit Backups" folder located in your Skyrim data folder. 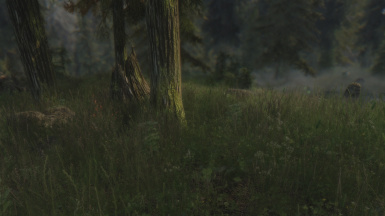 You can also uninstall and reinstall verdant to revert this mod back to it's original settings. And that's it! 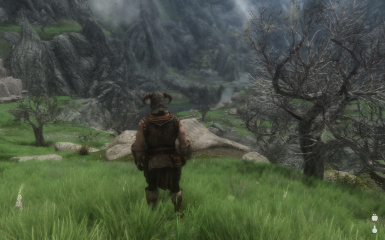 You can now start up skyrim and test it in game. 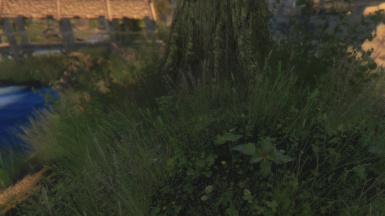 PRO TIP: You can also add your grass into verdant WITHOUT mod dependancy by selecting the grass you want from another mod, right clicking and select "Copy as new record into.." it will ask for a new name but just call it flower01b or whatever you want, and when it shows a selection area check only "Verdant" in the list and hit "OK". NOW YOU HAVE THAT FLOWER IN VERDANT NOW WITH NO ESP DEPENDANCY. 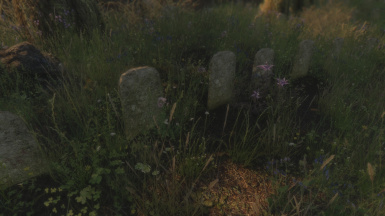 So long as the parent mod still remains installed, you can uncheck that .esp and use verdant or whatever grass mod you want to hold your very own mix of grasses. 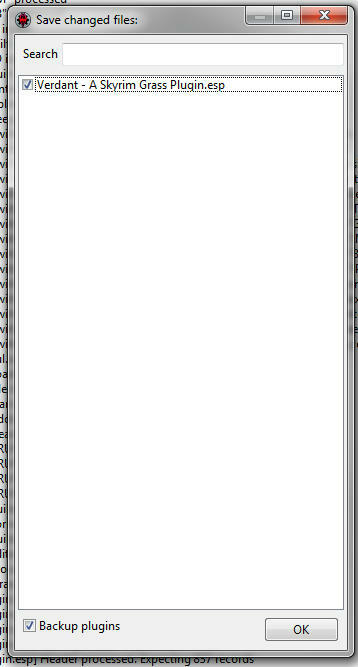 This is more or less what I did in order to make my own mod. 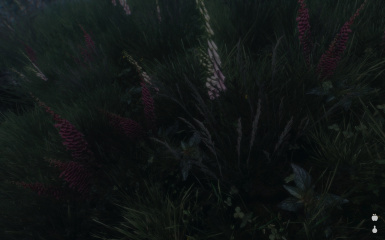 A bit of SFO, a bit of unbelievable Grasses, Hoddminir flowers, Unique Grasses Plugin and some Tamriel Reloaded as well. 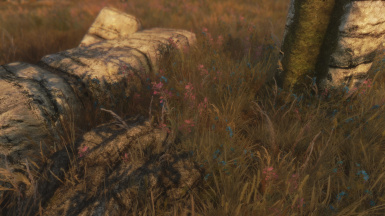 PRO TIP: Just remember that if you add more than 15 kinds of grasses tied to one grass list on one of the "Landscape Textures" you're going to have to up your iMaxGrassTypesPerTexure everytime to get those grasses in-game. If you make anything you want to share, please be sure to ask the mod authors permission first! !